Item Number: H20-E1265CL Have a question about this item? 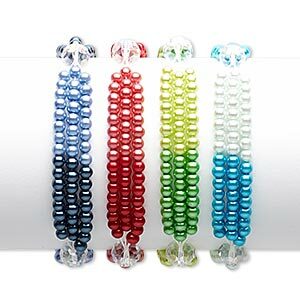 Beads can contain AB and luster finish. Colors can include clear, light purple, light green and more. Materials can include glass, millefiori glass, sea "opal" glass and glass pearl. 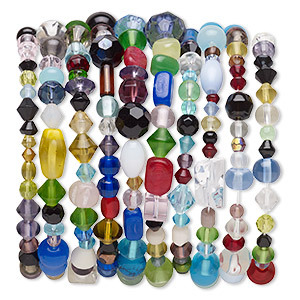 Shapes can include round, faceted bicone, cube and more. 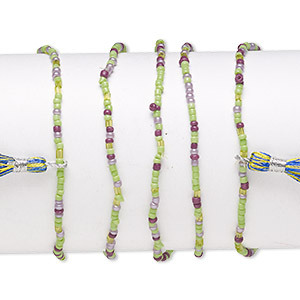 Bracelet mix, 3-strand stretch, glass and glass pearl, mixed AB colors, 4mm round and 10x8mm faceted rondelle, 7 inches. Sold per pkg of 4. 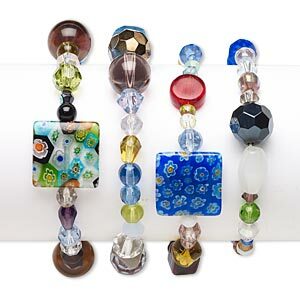 NEW - Bracelet mix, glass, opaque to transparent mixed colors, 3-10mm wide, 6 inches. Sold per pkg of 10. Bracelet mix, 2-strand stretch, acrylic / glass / elastic, pearlized mixed colors, 7.5mm round and 17x8mm flat rectangle, 5-1/2 inches. Sold per pkg of 5. 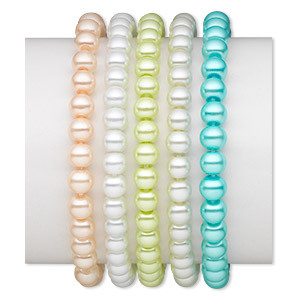 Bracelet, stretch, glass pearl, pastel colors, 6mm round, 6 inches. Sold per pkg of 5. 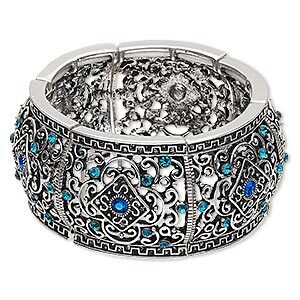 Bracelet, stretch, glass rhinestone and antique silver-finished "pewter" (zinc-based alloy), blue and blue AB, 32.5mm wide with diamond and swirl design, 6-1/2 inches. Sold individually. 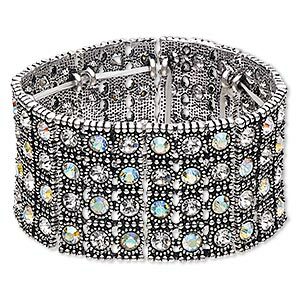 Bracelet, stretch, glass rhinestone and antique silver-finished "pewter" (zinc-based alloy), clear and clear AB, 37.5mm wide with 4-row design, 6 inches. Sold individually. 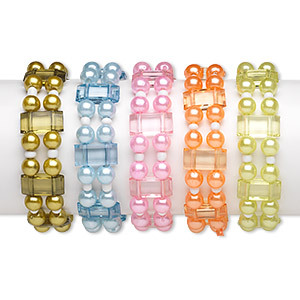 Bracelet, stretch, glass and acrylic, clear, 7-8mm round, 6-1/2 inches. Sold individually. Bracelet mix, stretch, glass, multicolored, #6 round with 23x15mm twisted leaf, 7-1/2 inches. Sold per pkg of 5. 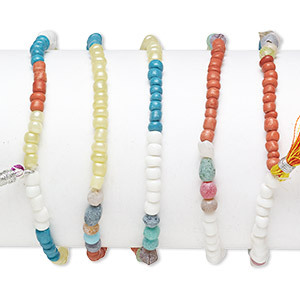 Bracelet mix, stretch, glass, multicolored, #6 round with 40mm tassel, 7-1/2 inches. Sold per pkg of 5.